Spirited coastal Mexican menu is a south-of-the-border success in the trendy Lower Highland neighborhood. Entertainment: Live music Sundays 2:30 p.m.-5 p.m.
: Experiencing Lola's brunch on a lazy weekend afternoon has become a habitual pastime for Denverites, who descend upon this coastal Mexican food restaurant for serious sipping and supping. The lofty space, decked out in desert hues, weathered hardwood floors and south-of-the-border kitsch, is raucous, festive and a full-tilt party, especially during happy hour when the tequila flows with abandon. 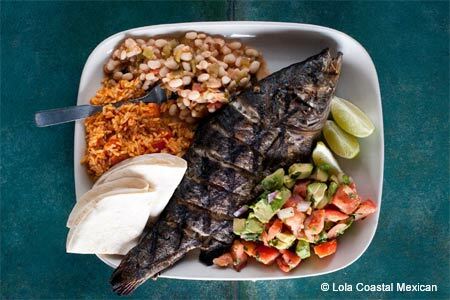 The menu, a catchall of deftly prepared Mexican standards, grilled fishes and meats and seafood stews, is playful. Start off with the guacamole, prepared tableside. The raw bar is a big hit, too, especially when the sun beats down, and every Sunday night, the kitchen doles out family-style paella buoyant with seafood. The patio, which offers some of the best views of Denver's cityscape, bustles on weekends when crowds linger to sip Bloody Marys and nosh on breakfast enchiladas or horchata pancakes.